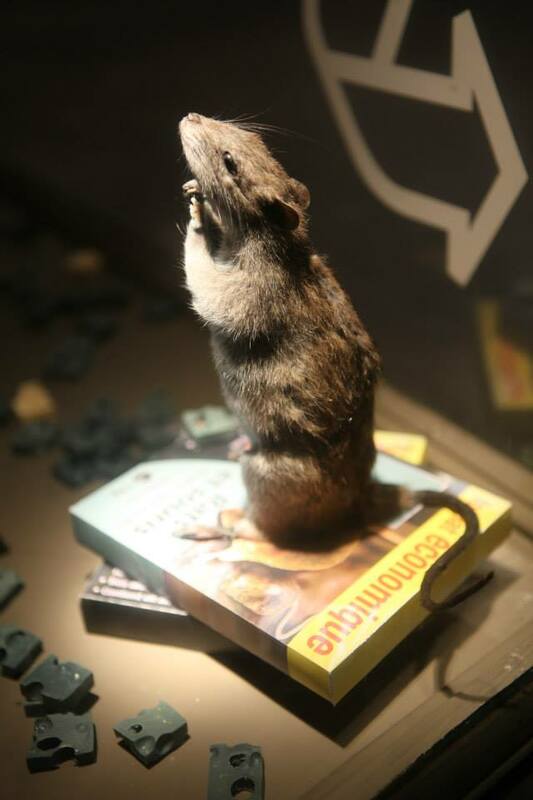 Recently I read „Traurige Therapeuten“ by Ingomar von Kieseritzky („Sad Shrinks“, not yet available in English) quite an animalistic book – a parade of neurotic pets meet an amateur therapist and some a taxidermist. Today Carlo Amen popped up at Vitrine 5 and showed me some of his works. „Tatoodermia“ caught my attention, tattooed cats behind prison bars, a tattooed goose and a praying rat. One might object that after Wim Delvoye tattooing animals is passé. And Banksy spraying rats everywhere. But the animals of Carlo Amen are uncanny and brute (in both senses). Without pathos he demonstrates how we disrespect pets. We anthropomorphize them but treat them very immune at the same time. Of course rats endangered our species for centuries and still are. But they only show us our own vulnerability. So Carlo’s rat might pray for mercy and forgiveness. Amen.